Sea Map is a map viewer that supports both online Maps and offline Open Sea Maps for planning and light navigation purposes. Sea Map comes with a preinstalled set of community created open source navigational maps which can be used, even when you have no data network available. This means that you can navigate, without the roaming charges that come with the use of online maps. But Sea Map does not just support any map, it supports sea maps! Since means you have additional features such as lights and buoy markers that are not visible on the normal map. What can and can’t you do with Sea Map? Every mariner knows you should use certified charts for navigation, and since the nature of community charts is by definition not official, you should not rely on Sea Map to be your primairy and only source of chart material. That beeing said, Sea Map is a great utility and the power of open source community maps may very well lead to better and faster updated charts for particular areas. You can use Sea Map to check features and to quickly find your way, and it will prove to become your chart table in your pocket. Why is there no map for my region? Sea Map is a viewer for community sea charts. If there is no map for your region, you can help in creating it by joining openseamap. How can I get a better/newer map? You can join the mailing list and request maps from there. We follow the releases of openseamap closely and will provide updates (free of charge) with the latest maps. What Maps are in SeaMap? I have downloaded SeaMap EU but i am unable to zoom in on any port on the North Sea or English Channel to see the navigational buoyage as depicted in your view of Rostock. Without the navigational marks the map is of little use. Am I doing something wrong? The north sea map is very high level, and also it doesn’t seem to have many markers yet. Please note that the map data is provided by http://map.openseamap.org/map. I’ll check if they have released a more detailed map and provide an update. 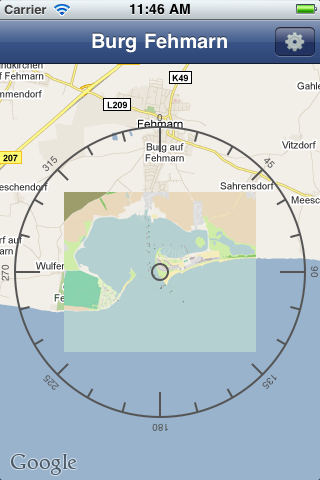 Another user emailed me a geo-referenced map of Den Helder. I’ll add support for community overlays to allow even more maps with more detail. The SeaMap version for the US is out. With over 1500 official NOAA maps. Go check it out in the app store! I bought the SeaMap app for my ipod touch -but cannot find the NOAA charts for Atlantic Coast-US. What did I do wrong ? Can I erase maps that I will not need ? Thank you. You can but it will not help you very much since SeaMap supports the OpenSeaMap database which has little maps in the US. However I also have an application called “SeaMap US” which does support all NOAA maps. If you drop me an email with your device id on info.lukysoft -at- gmail -dot- com I can lookup your purchase and issue a code for the US version.